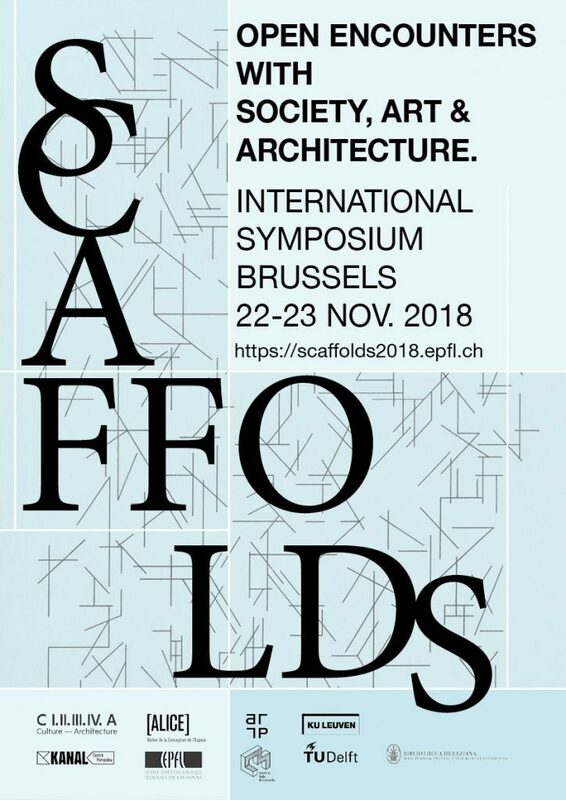 Please note the extended abstract submission deadline for “Scaffolds. Open Encounters with Society, Art and Architecture” International Symposium. It will take place in HOUSE 3, generously hosted by CIVA/KANAL- Centre Pompidou in Brussels. You can submit your abstracts until October 5th 12 PM. In addition to the parallel sessions corresponding to the three open tracks (see attached Call for Contributions for details), the Symposium will feature panels curated by researchers at Metrolab Brussels, KU Leuven, TU Delft and The Berlage. These will touch upon a diverse set of topics relevant to the scope of the symposium, from the role of third places in the making of city fabric or embodied practices and the poetics of value, to the relevance of new approaches to infrastructure projects. Registration for participants giving article presentations is €150. Attendance to all the sessions, panels and lectures is free of charge. We would appreciate if you could post/forward this information to your colleagues and students. Looking forward to receiving your abstracts and to seeing you in Brussels on 22nd, 23rd and 24th of November! Darío Negueruela del Castillo, on behalf of the Scaffolds team.